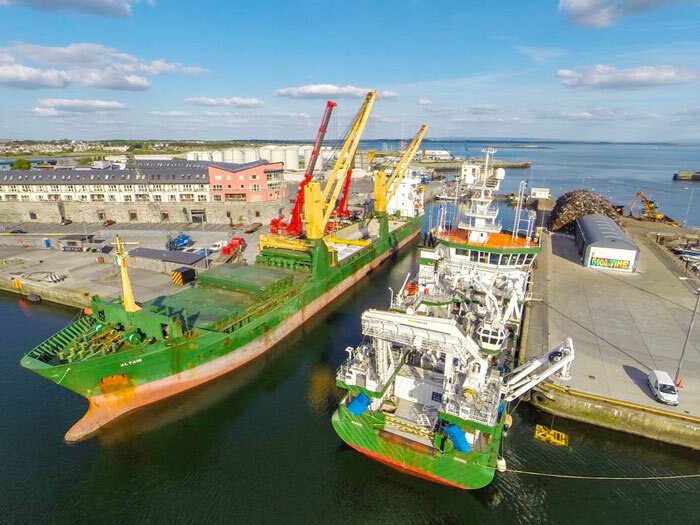 Regularly vessels of 6,000 tonnes deadweight visit Galway, which has a total quay length capable of allowing up to 6 vessels in the inner dock at any one time depending on the vessel sizes. Although Galway is tidal, the dock gates maintain a high water level within the tidal basin and vessels can dock and sail 2 hours before and up to high water. The year 2017 saw 300 vessels totalling 602,299 tonnes of cargo through the port. Of this, imports were 465,290 tonnes and exports 127,080 tonnes. Exports were Scrap Metal and Limestone. 1 X 40 tonne harbour mobile crane (Sennebogen 640M/K2) suitable for grab discharge/loading and lifting work. Heavy lift cranage can be hired in locally. There are no tugs at Galway. Vessels over 6,500 are evaluated on a case by case basis by the Harbour Master and are arranged through the local agent. The Harbour Company has 2 X 8,000m²-covered storage warehouses which are on long term lease. Open yardage of approximately 10 acres at the Port Enterprise Park is available for short and long term leases. Centre Quay: 1,330m² storage for cargoes such as logs, limestone or scrap metal. A fully automatic and certified 50 tonne weighbridge is located near Dun Aengus Quay North was commissioned in 2007. By road tanker from various suppliers. The port can accept ships garbage in compliance with Marpol 73/78 annex V.
The Port is compliant under the terms of the ISPS Code and enhanced Port Security. Waste Lub Oils and dirty bilge water can be handled by local contractor in 35m³ road tankers. Freshwater is available on all quays at a rate of 20 tonne per hour. The maximum length of ship permitted is 120m. Any vessel greater in length than 120m needs specific approval from the Harbour Master. 6.5m Neaps & 7.2 m Springs at present. The dock gate to the port is 19.81m wide (65 feet) and the depth over the cill corresponds to the depth in the approach channel.